As a relatively new industry, some of the day-to-day assumptions and terms that are used in the world of coworking are new to many people. Here we have gathered a number of key terms and concepts and provided our own definitions and explanations. Hopefully you find these helpful! A relatively new approach to working and workspace wherein individuals (freelancers, startups, and small businesses) and companies (large and SME) work on their own projects in a shared, community oriented space. The first coworking space was founded in 2005 in San Francisco, and at last count there were over 11,000 coworking spaces up and running in the world. A reference to systematic efforts to initiate and maintain cultural, process, or behavioral changes inside large firms. These efforts often accompany mergers and acquisitions, changes in top leadership, exiting old businesses or entering new ones. Sadly, only roughly 30% of corporate change initiatives are considered successful. This refers to the experience that employees and non-employees associate with working in a particular company. That is, what is it like to work for company X? What sorts of associations, identity structures, values do people make with the company? Similar to the notion of corporate culture, but it pertains to how a company’s culture is perceived, as a brand, both inside and outside of the company. This is a measure of the extent to which employees connect with their employer, are challenged by and engaged with their work, and want the company to be successful, The most recent Gallup Poll put the corporate employee engagement rate at around 32%. Gary Hamel, one of the world’s leading management experts, commented recently that employee engagement scores have remained constant since the 1960s. One of our CRE services wherein we peer-review our clients’ initial financial projections against our own. It is our process for assessing our clients’ assumptions- about revenue potential, costs, space design, and business models- so that we can help them craft sustainable business models for their coworking businesses. A sub-industry within the world of management consulting that is focused on the role of culture in driving/inhibiting company effectiveness. Often, culture consulting hinges on the establishment of cultural types, which are measured via large surveys. These models capture where a company is now, and then helps establish a roadmap for where a company wants to be in the future. However, like change management programs, these programs are largely out of step with a rising popular culture that is much more individuated than these models assume. Our approach to culture change is a Design-centric approach in that we use the design intervention of coworking to materially alter the patterns of how people work and interact. Only through material changes do lasting cultural changes occur. Rarely do you hear people talk about employee experience or ‘employee experience design.’ We hear a lot about customer experience and user experience design, but not in relation to the experience of work. Coworking, we believe, simply provides a better, more human-centered way of working for those fortunate enough to work this way. That is why our whole business is focused on enhancing the experience of work for our clients’ employees and tenants. Refers to efforts inside large firms to bring the design, work flow, and ethos of coworking into the company campus and work experience. A somewhat new concept at this point, companies such as Sprint, Verizon, Coca Cola, and Google have implemented variations of enterprise coworking. According to our own research and insight, we see workspaces in many companies in the future being designed and managed more or less like coworking spaces. ABW is an approach to working wherein no employees (including the CEO) has a fixed work station. Rather, each employee is provided a laptop and a locker, and works in different areas of the office depending on the activity they are engaged in at the time. 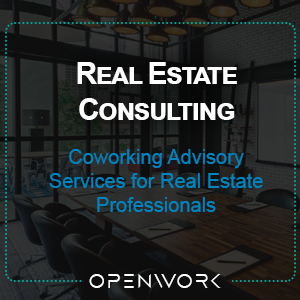 There are multiple types of work areas in ABW offices (open and busy, quiet and private, small group rooms, large group rooms, phone booths, etc). Similar to enterprise coworking in many ways. Early pioneers of the coworking movement codified the core values of coworking as: community, openness, collaboration, accessibility, and sustainability. We have interpreted these in our own work to focus on: choice, autonomy, flexibility, and community. This is just what it says! What are the elements that make a particular company compelling and attractive (or not) to work for? EVP is centered on the employment brand, which is the sum of the experiences, values and reputation that is associated with working for a particular company. When talent is in short supply and companies have to go the extra mile to attract and retain top talent, they invest in the EVP. When there is a glut of talent, many firms don’t attend to the EVP very much. This is a phrase stolen from strategy consultant Geoffrey Moore. He wrote about the chasm as part of the technology adoption life cycle, defined by innovators, early adopters, late adopters, and laggards. Similarly, we are seeing a chasm being crossed in the coworking industry. As coworking crosses the chasm and late adopters get on board, it is finally becoming mainstream. See the white paper- The Coworking Industry: Then, Now, and the Future for more. This is a reference to the necessary technology that goes into running a coworking or shared workspace business. This includes the membership onboarding and management software that handles recurring billing for memberships, the booking and billing for the use of meeting and conference rooms, as well as the membership directory for internal uses. This also includes events management, often for after hours events. At the center of the plumbing is a POS system that is the payment gateway for all transactions in the space. Increasingly, the coworking plumbing includes more social tools, so that members can communicate and collaborate with one another and not just with the community manager.